Plainly we are not food photographers! 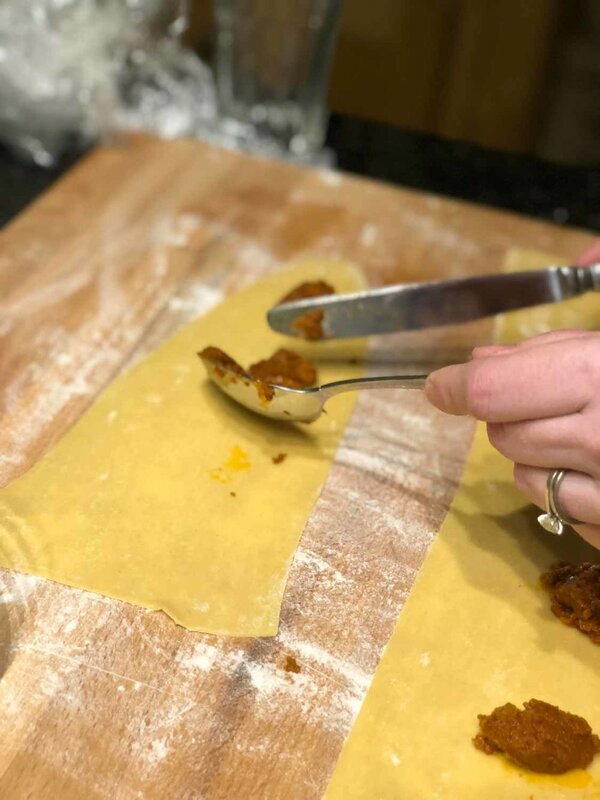 My daughter and her boyfriend bought Claire and I a Ravioli lesson for Christmas, with one thing and another getting in the way we only got around to attending at the beginning of April, all four of us rolled up to Burro e Salvia in Shoreditch and initiated into the dark art of Ravioli making. What fun it was, we were handed a jolly nice glass of Italian Valpolicella (Disarmonico Rosso Veronese 2013) and proceeded to mix flour and egg then roll and stretch the dough in preparation for forming, stuffing and cutting, a couple of hours later we left with cardboard boxes full of gorgeous pasta packages. We cooked and ate the lot, coated in a butter and sage sauce. And I confess that since we have made our Ravioli at home twice and boy was it delicious. More than anything it was a charming experience, just an excellent time to spend with my family, we giggled and made a little bit of a mess, and it was memorable and pleasant. It occurred to me that is what is happening when customers come to the studio for a shoot; sadly you will not have handmade ravioli, you will, however, go with a warm glow one which will stay with you for some time. Be under no illusion coming to Nousha Photography for a family portrait session is an experience, this is most definitely not one of those sessions you may or may not have experienced at the hands of your parents in the days of yore. Some parents have said that their children talk animatedly about the photo shoot months after the event! Months! Can you believe it? Children, when asked what they would like to do, swimming, cinema, zoo have been heard to reply, "Can we go back to the studio?" I know this is hard to believe, but I assure you this is what is happening, a lot. Don't think of the photo session as a chore; you will enjoy it, and you will thank me in the future for having encouraged you to come. 80gms of '00' flour, Italian if you can find it. With a spoon gently mix the egg with the flour until you have a dough, then knead it with the palm of one hand against a wooden board, fold the dough in half then push down with your hand stretching it out repeat until lit feels somewhat velvety in texture, knead for about 5 minutes. Mould the dough into a ball and wrap with cling film to keep moist and allow to rest for a 5-10 minutes. 1 good handful of grated Parmesan and a bit of Pecorino if you dare. Fry the tomato paste thinly sliced garlic and the anchovies in a little olive oil, ensure the anchovies disintegrate give them a little help by squashing them in the pan. When this mixture has taken on a bit of colour, sort of a darker tomato shade, remove from the heat and pour into a small food processor, add 3/4 of the cheese in with it and whiz until you have a smoothish paste, not too smooth. Now prepare your pasta dough by either rolling it our so it is thinner than you feel comfortable with! Or using a pasta machine. You need two strips as seen in the pictures, place little spoonfuls of the tomato mixture at regular intervals as in the pictures, the fold the nearest edge over the dough. Now pinch to create little parcels of greatness (soon to be your ravioli!) and with a pastry cutter cut forward from you in between the small packets. Now sprinkle with semolina flour and allow to rest. -Boil a lot of water, add a lot of salt, as salty as the sea I was told. -Now gently drop your masterpieces into the boiling water, 3 minutes tops. - When the butter is frothing and turning nutty brown drop the sage leave into it. Remove from the heat immediately. Drain the ravioli delicately taking care not to break them. Place on a plate and cover with your butter sauce.